Chavez, Steinbeck: The ties that bind. By UFW Spokesman–and longtime Cesar Chavez press secretary Marc Grossman. John Steinbeck’s “The Grapes of Wrath” is more than a classic novel exposing a dark underside of the California dream. It raised widespread public awareness about the plight of migrant farm workers and set the stage for the rise decades later of Cesar Chavez’s movement. Just as literature and history are sometimes linked, so are John Steinbeck and Cesar Chavez. Communities across California are honoring Steinbeck with events encouraging people to read what many view as one of America’s greatest novels. So this is a good time to recount those links. Steinbeck carefully based the characters and subjects of his three novels chronicling farm labor strife–“The Grapes of Wrath,” “In Dubious Battle” and “Of Mice and Men”–on real people and events. Much of the material for those early books came from the time he spent around his birthplace on the Central Coast and in the Central Valley. The government-run farm labor camp that offered the Joad family the only respite during its troubled journey in “The Grapes of Wrath” was based on the Sunset Camp, between Arvin and Lamont south of Bakersfield. Fred Ross, the man who actually ran that camp shortly after Steinbeck left the area, was a little known but remarkable community organizer whose career spanned seven decades. Around the time Ross was managing the Sunset Camp, an 11-year old boy began following the migrant trails of California with his destitute family. As with many of the Depression-era Oakies from “”The Grapes of Wrath”,” the banks took Cesar Chavez’s parents’ small family farm in the Gila River Valley near Yuma, Ariz.
Like the Joads, the Chavezes worked the fields and vineyards of the southern San Joaquin Valley during that time. But Chavez and Ross didn’t meet until later. Segregation was the practice, if not the rule, and the Sunset Camp was for Anglos. The two met for the first time a decade and a half later, in 1952. Ross was organizing the Saul Alinsky-affiliated Community Service Organization, then the most militant and effective civic-action, civil rights group among Latinos in California. In the late spring of that year Ross came to the eastside San Jose barrio of Sal Si Puedes (get out if you can) and sought out Chavez, who was laboring in nearby apricot orchards. That encounter “led to a lot of things,” Chavez said much later. Chavez credited Ross with discovering and training him, and–over 40 years–becoming his best friend. 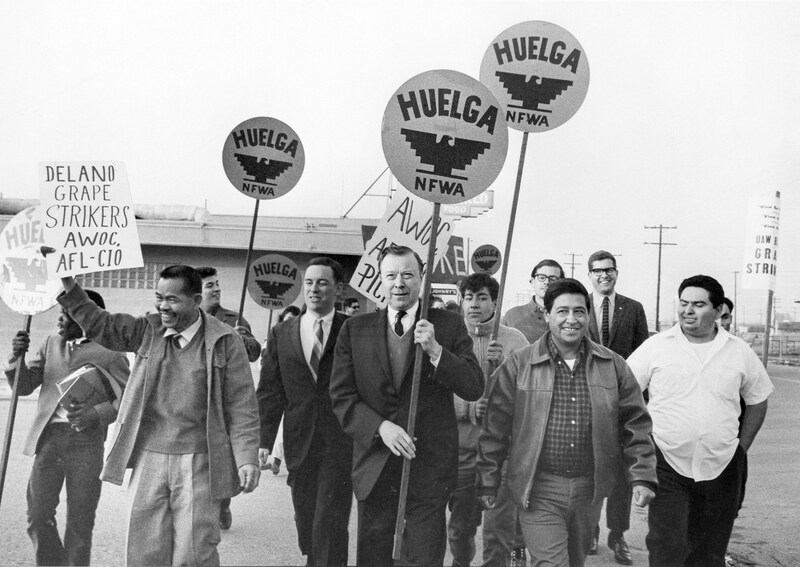 Another link to Steinbeck came out of the blue in summer 1971, one year after Central Valley table grape growers signed their first contracts with Chavez’s United Farm Workers, capping five years of strikes and boycotts. Chavez was in his office at “Forty Acres,” then the UFW’s headquarters just outside Delano. I was a young Chavez aide working on a summer project during a break from college. His secretary informed Chavez that “an old guy” was in the lobby asking to speak to someone about times past. “I’m busy, have him talk to one of the organizers,” Chavez replied. About three hours later she said the old man hadn’t left. “What’s his name?” Chavez asked. “Pat Chambers,” the secretary said. Chavez’s face lit up, he bolted down the hall and Chambers, Chavez, his driver and I spent the rest of the afternoon driving around Delano and talking. Mostly, I listened. Chambers was a lead organizer with the Communist-led Cannery and Agricultural Workers’ Industrial Union (CAWIU). He led the biggest field walkouts of the early- and mid-1930s, including the Corcoran cotton strike of 1933. Before Chavez, most farm union leaders were non-farm workers, outsiders sometimes aloof from the people they tried to organize. Not Chambers. He lived among the workers of all races who fed, housed and protected him. Carey McWilliams, in his classic 1935 expose, “Factories in the Fields,” notes that Chambers was “a small, quiet, soft-spoken man, but a person of great courage and significance”–a description not unlike that offered years later about Chavez. One of Chamber’s bodyguards in the ’30s was Gonzalo Flores, Chavez’s cousin by marriage. When Chavez was young, he listened raptly to tales of this legendary farm labor organizer, Pat Chambers. Chambers was convicted in 1934 for violating California’s criminal syndicalism law. It banned “advocating, teaching or aiding and abetting…unlawful methods of terrorism as a means of accomplishing a change in industrial ownership or control”–which in Chambers’ case included union organizing. He was released after serving time in San Quentin, but never returned to organizing, instead becoming a union carpenter in San Pedro. Chambers avoided coming to Delano during the five-year grape strike, he added, out of fear Chavez would be redbaited because of CAWIU’s Communist ties. But on that bright summer day, Chavez took Chambers to visit with his cousin, Gonzalo Flores, who by then was elderly and disabled by diabetes. The two men remembered each other warmly and reminisced. A few weeks later, Chambers returned to Delano. Chavez was gone so I met with him. Since Chambers and Steinbeck were in the same region at the same time, I asked Chambers if they ever met. Chambers responded with a cascade of swear words. I quickly dropped the subject. Later, Ross said some believed Chambers had provided material for the communist labor organizer from “In Dubious Battle,” which depicts a strike that turns violent–a theory I later heard confirmed by Steinbeck scholars. Perhaps if someone wrote a book like that about me I wouldn’t like him either. Finally, the two men were joined by how they defined the solution: collective action by the very people who were, and continue to be, oppressed by an agricultural system that produces such abundance on this rich land. The color of the farm workers Steinbeck and Chavez championed may have changed. But their cause and basic humanity have not. That is what both John Steinbeck and Cesar Chavez affirmed, each in his own way. That is also why both of them have been so admired–and so vilified.